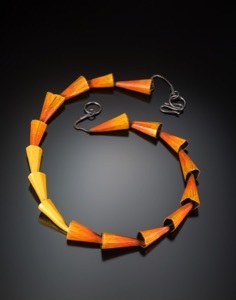 Jewelry artist Peggy Shiffrin works mainly in gold, silver, copper, and brass, and is most fascinated by discovering what these metals, on their own, can become. 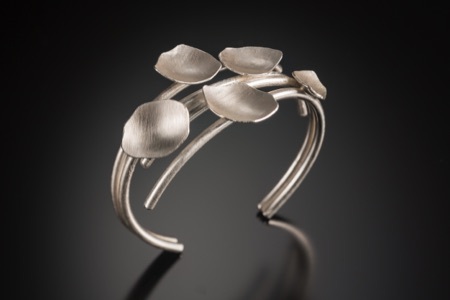 Her designs are simple, clean and contemporary – often inspired by botanical forms. When some color is called for, she applies layers of colored pencil, to achieve rich luminous effects. Peggy has been metalsmithing on and off since the age of 10 and has studied extensively at the Art League School in Alexandria, VA. She has shown her work at a number of local group shows, including The Ladysmiths Jewelry Shows at the Ratner Museum, the Somerset Town Hall and Arena Stage, The Pleiades Art Jewelry Show and Sale, and The Waverly Street Gallery's annual members and guests show. Click here for her website. Follow her on Facebook and Pinterest.